Our logo is the key element in our visual identity. It is fresh, modern and organic. 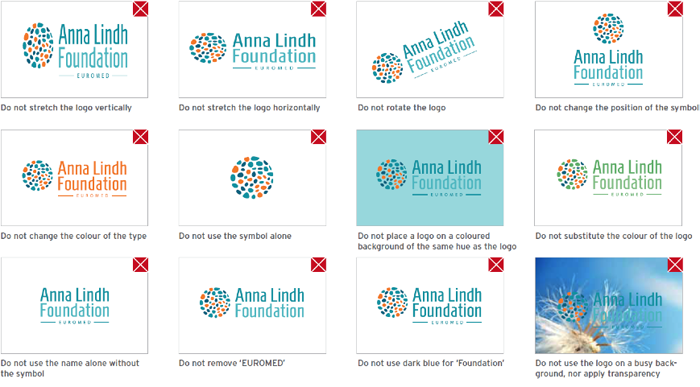 It always includes two elements: the symbol, and the name which consists of the ‘Anna Lindh Foundation’ and ‘EUROMED’. The symbol and the name should never be used separately except for the official ALF website favicon, official ALF twitter account profile picture and official Facebook ALF profile picture. The minimum clearance space around the logo should be equal to the height of the letter ‘A’ in the actual logo size used. The minimum logo size is 1cm in height. Smaller sizes should be avoided in order to keep the word EUROMED legible. The logo must never be cropped, rotated, redrawn or changed in anyway or have the text substituted by another typeface.